I finally did it. I pulled up the last row of kale in my garden at Uncle Bob’s. It is true that I planted too much kale. 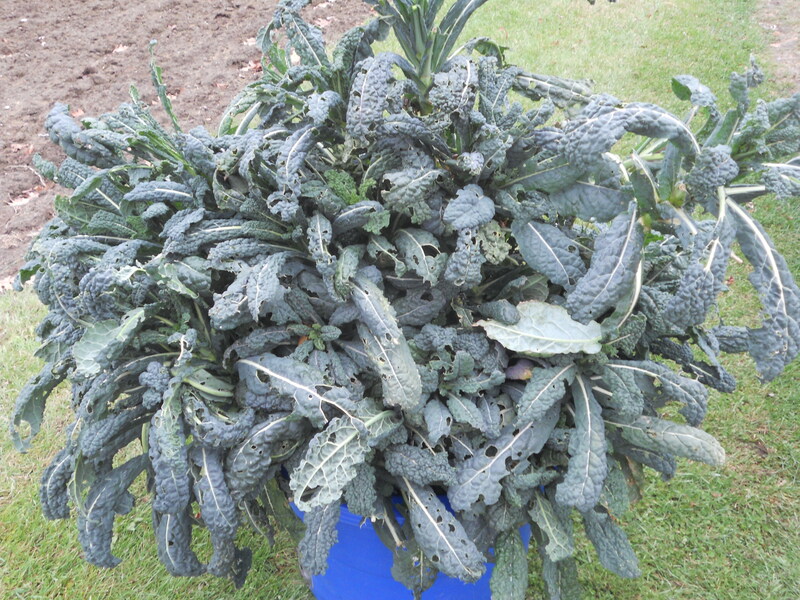 If I lived near Uncle Bob, I would have eaten kale every day, but since I don’t, a lot of good kale went to waste. Kale may very well be the latest trendy miracle food celebrities are juicing, but not in Lisbon Falls. 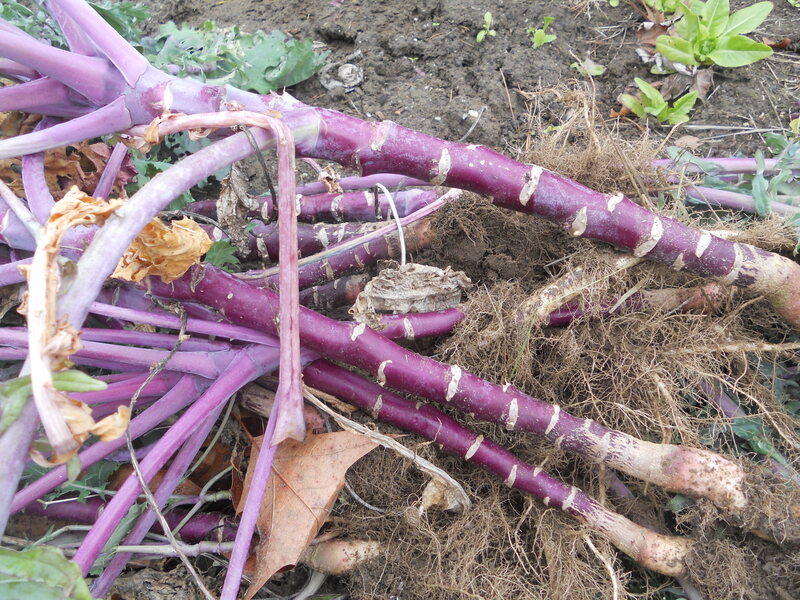 Look at the size of these kale stalks. It’s pretty amazing to think that one little kale seed sprouted, grew, and turned into this big stalk. Here’s the dinosaur kale I pulled out of the garden. If I had been thinking, I would have wrapped a big red bow around the tub and used the picture as a holiday card. I hope the critters over on The Farm had a tasty, trendy snack. When I was done pulling up all the kale, I went into the barn and got the hand tiller. This tool does a good job of skimming and fluffing the surface of the soil without doing much deep damage. I’ve “tilled” my garden using a shovel and a hoe before, too. I try to avoid the rototiller because (gasp) deep tilling is bad for the soil. Soil is an intricate network of particles and living things. The clumps and particles act to preserve the integrity of the soil, help hold water, and prevent erosion. Over-cultivation of the soil by rototilling causes soil compaction, exposes and depletes nutrients, and kills micro-organisms. I suppose I could blame Henry Jethro William Tull. Tull was an 18th century farmer of sorts who invented the horse-drawn hoe. He believed that fertilization of the soil was unnecessary and it could be avoided by pulverizing the soil. Uncle Bob is a Jethro Tull fan, although he doesn’t know it. He loves to rototill the garden. He tills in the spring and he tills in the fall; he tills when he pulls up a row of beans and he tills when he pulls up a row of corn. I’ve tried and tried to explain to him that it’s not necessary, except on the occasions when I bring in a load of manure. In spite of my protestations, he bought a bigger rototiller this year. He likes the garden to look neat and organized, like a combed head of hair. It’s just one of those battles I’m not going to win, except in my own little section of the garden. After I finished hand tilling the kale rows, Uncle Bob came home and popped around the corner. He could see that I had pulled the kale and he said “how did you till those rows?” I explained my method and he laughed at me. There’s no telling if he’s machine-tilled those rows since I left, but I’m not going to complain. Uncle Bob let me bring the hand tiller to New Hampshire with me and I’m going to try it out at the Hampton Victory Garden. I have three garden spots to rototill. This entry was posted in Farmers and tagged garden tools, Jethro Tull, kale, No-till gardening, Rototilling. Bookmark the permalink. Properly dried, chopped up to the right size and stuffed into baggies, you might have had a cash crop there. I can see the black and yellow “Do not cross” tape surrounding Bob’s garden even as we speak.